Hazel Henderson is the founder of Ethical Markets Media, LLC and the creator and co-executive Producer of its TV series. She is a world-renowned futurist, evolutionary economist, a worldwide syndicated columnist, consultant on sustainable development, and author of The Axiom and Nautilus award-winning book Ethical Markets: Growing the Green Economy (2006) and eight other books. She co-edited, with Harlan Cleveland and Inge Kaul, The UN: Policy and Financing Alternatives, Elsevier Scientific, UK 1995 (US edition, 1996). Her editorials appear in 27 languages and in 200 newspapers syndicated by InterPress Service, Rome, New York, and Washington DC. Her articles have appeared in over 250 journals, including (in USA) Harvard Business Review, New York Times,Christian Science Monitor; and Challenge, Mainichi (Japan), El Diario (Venezuela), World Economic Herald (China), LeMonde Diplomatique (France) and Australian Financial Review. Her books are translated into German, Spanish, Japanese, Dutch, Swedish, Korean, Portuguese and Chinese. She sits on several editorial boards, including Futures Research Quarterly, The State of the Future Report, and E/The Environmental Magazine (USA), Resurgence and Foresight and Futures (UK). She sits on several editorial boards, including Futures Research Quarterly, The State of the Future Report, and E/The Environmental Magazine (USA), and Resurgence, Foresight and Futures (UK). She co-edited, with Harlan Cleveland and Inge Kaul, The UN: Policy and Financing Alternatives, Elsevier Scientific, UK 1995 (US edition, 1996). Since becoming a full-time TV producer, Hazel has stepped down from her many board memberships, including Worldwatch Institute (1975-2001), Calvert Social Investment Fund (1982-2005), and other associations, including the Social Investment Forum and the Social Venture Network. She remains on the International Council of the Instituto Ethos de Empresas e Responsabilidade Social, Sao Paulo, Brasil. 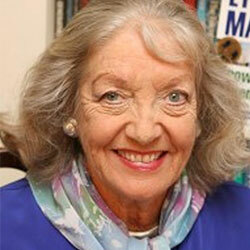 Hazel remains a Patron of the New Economics Foundation (London, UK) and a Fellow of the World Business Academy. The first version of her Country Futures Indicators (CFIý), an alternative to the Gross National Product (GNP), is a co-venture with Calvert Group, Inc.: the Calvert-Henderson Quality-of-Life Indicators (Desk Reference Manual, 2000), updated regularly at www.calvert-henderson.com. In addition, she has been Regent’s Lecturer at the University of California-Santa Barbara, held the Horace Albright Chair in Conservation at the University of California-Berkeley, and advised the U.S. Office of Technology Assessment and the National Science Foundation from 1974 to 1980. She holds Honorary Doctor of Science degrees from the University of San Francisco, Soka University (Tokyo) and Worcester Polytechnic Institute, Massachusetts (USA). She is an active member of the National Press Club (Washington DC), the World Future Society (USA), a Fellow of the World Futures Studies Federation and a member of the Association for Evolutionary Economics. Hazel has many awards and is listed in Who’s Who USA, Who’s Who in the World, Who’s Who in Business and Finance and Who’s Who in Science and Technology. She is an Honorary Member of the Club of Rome. She shared the 1996 Global Citizen Award with Nobelist A. Perez Esquivel of Argentina. In 2007, she was elected a Fellow to Britain’s Royal Society of Arts, founded in 1754, and in 2010 she was honored as one of the “Top 100 Thought Leaders in Trustworthy Business Behavior 2010” by Trust Across America. To read more about Dr. Henderson, visit her personal site.